As 2014 draws to a close, I look back at some of the more memorable food experiences of the past year. 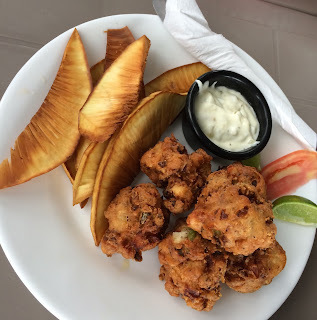 With travel, I got to expand my culinary horizons a bit, as well as revisit some old favorites. So, let's reminisce. Mary Macs is an institution of Southern cooking in Atlanta, and a tourist attraction. But most notable for first timers is a bowl of pot likker with the excellent corn bread. The salt pork suffused liquid from cooking greens was quite welcome on a rainy day. I finally got to try Pig Wings at the Old German Beer Hall in Milwaukee. I'm surprised we don't do this in Houston. What we do do in Houston are these creative fish chicharrones at Tampico on Airline. Basically tilapia cooked to crispy chip consistency, the spicy picked onions was a genius accompaniment. At Rangoon Ruby's (with branches around Northern California, this one was at the Palo Alto location), I got to try the fermented tea leaf salad (thoke on Burmese). Excellent and unique flavors, with a large dynamic range of textures and flavors. Here in Houston, however, getting to eat an egg custard tart from ECK bakery fresh out of the oven is in itself a pretty unique treat. Al-Aseel is probably best known for fried chicken, but the restaurant serves up dishes designed to encourage people to linger. Pillow lined corner tables beckon, and this beautifully plated and delicious hummus denotes meals of sharing and community. The loco moco is an iconic dish of Hawaiin adaptability, and at Ma'Ono in Seattle, it's elevated to high art. 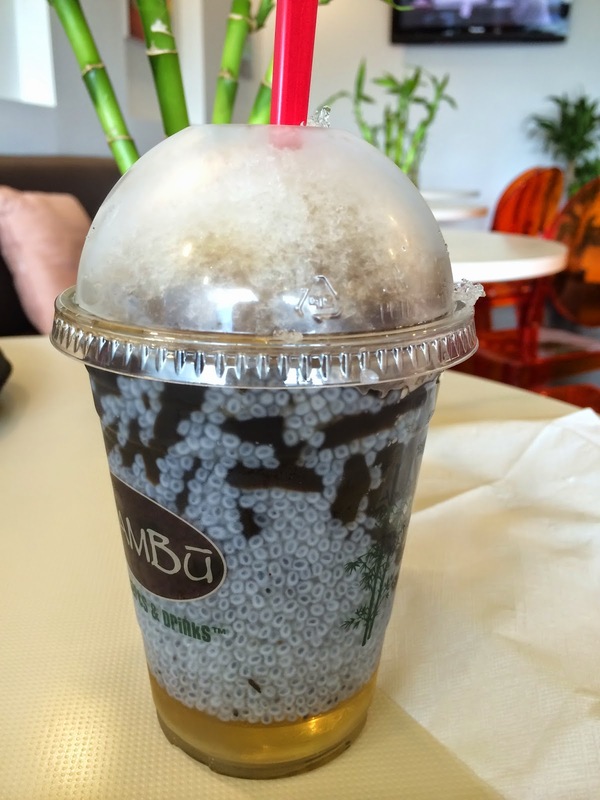 Bambu opened a new branch in the Greenway Plaza area, and the icy che preparations are refreshing in the Houston heat. I returned often to try the different combinations, but settled on the basil seed rich "black and grey" as a memorable combination. The venerable Mala Sichuan collaborated with Blacksmith Coffee on a one time popup brunch this year. On a packed menu of old Sichuan comfort breakfast items, the beautiful and crispy gold coin omelet stood out in my mind. Steve Marquez opened my year with a bang by crafting this complex and complete dessert - a spicy chocolate cake topped with fish sauce caramel. I believe the restaurant Spicy Sichuan has closed, but I did get to try this unique dish there: a roulade of sticky rice "pasta" filled with spiced meat and vegetables. By way of introduction from Javier Fadul (@inspired12 on Twitter) of Culture Pilot, I went to try the very rich and flavorful uni carbonara at Tea Bar Organics (normally, I'd stay away from any place that primarily hawks the organic food fallacy). But this dish was indeed quite memorable. The bakery/cafe Tout Suite opened in downtown Houston this year, and in addition to have an overall strong coffee and tea program, the pastries were on point. This Paris brest illustrated to me the mastery of choux in that kitchen. On deficiency in Houston is in the area of hot chocolate, more notably, the sipping chocolate variety. I had to travel to Durham, NC, to find Bean Traders, and their nicely done sipping chocolates drinks. And finally, a bit of international flair. In Vancouver, the very busy JapaDog establishment serves up these Japanese hot dogs. But unlike the usual trend of topping the same hot dog with different things just to create variety, each type had the careful consideration of a sushi chef. Down to the obsessive manner the bread is heated, to the pairing of sausage with (in this case, grated radish or shaved bonito), a Japadog stood out in the competitive Vancouver dining scene.